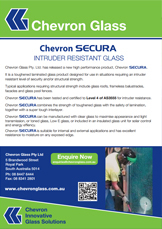 Secura is a toughened laminated glass product designed for use in situations requiring an intruder resistant level of security and/or structural strength. It is available in 12.56mm and 14.28mm thicknesses and has been tested and rated to level 4 of AS 3555 (Testing and rating for intruder resistance). Photographic images are digitally printed onto PET film which is inserted and laminated between glass. Standard or individual designs can be printed on PET film and laminated between glass. Graphic provides a standard range of printed designs that offer privacy with good light transmission. Custom made designs are available when large pixel images are provided. 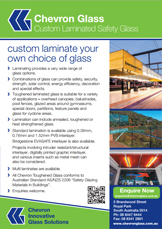 Graphic is a grade A safety glass suitable for glass roofs, sunshades and internal partitions. Steel mesh of varying designs and up to 3.0mm thickness can be laminated between toughened glass. Ideal for solar control with aesthetic appeal. Chevron Mesh also has the benefits of privacy and safety. This is a toughened laminated glass with properties which make it very difficult to penetrate. This product is avialable in varying configurations of glass types and thicknesses and is designed to prevent penetration by commonly available items. A steel security screen is inserted and laminated between toughened glass. This product offers a visible barrier and security utilising the additional strength of a steel screen.